First coat of paint has been sprayed. As you can see, although I tried to spray the paint fairly heavily, it soaked into the sheet and almost looks like it wasn’t sprayed very well. 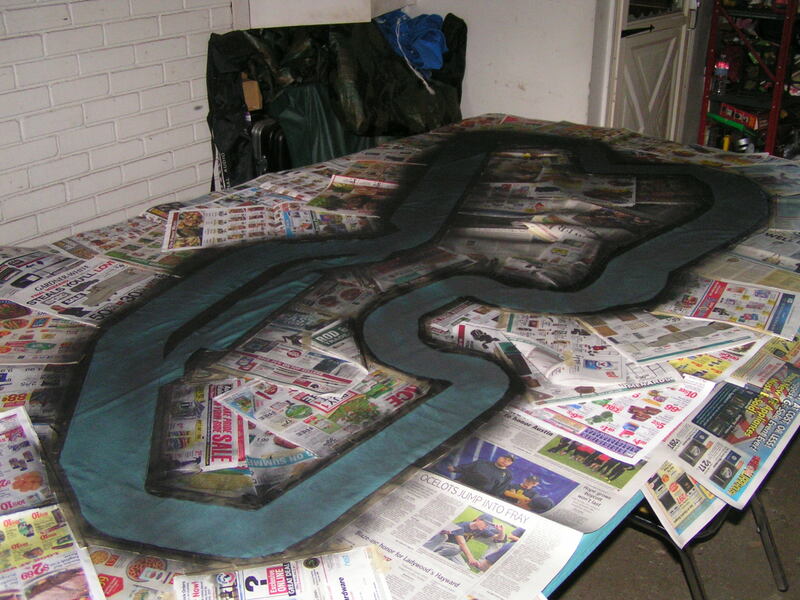 While I found that I usually only had to spray two coats of paint to fully cover a track in the past (allowing about 30 minutes between spraying each coat), this time I went cheap. Instead of buying a “name brand” of flat black spray paint, I opted for the “house brand” paint from a local hardware store. Big mistake. With the house brand paint, I had to apply about five coats of paint to get good coverage, and one can of spray paint wasn’t enough to do the entire job! I had to start using a second can of spray paint. When I previously used the higher quality paint on other tracks, it would usually only take 3/4 to an entire can of paint to cover the track satisfactorily. The track after several coats of paint. Let the coats of paint dry enough to where you are satisfied with the results, then remove all of the masking. I suggest letting the paint dry at least a full day before applying any other markings to the track. There was a little bit of spray paint that “bled” onto the sheet, but it’s not too bad. C’est la vie, as they would say in France. 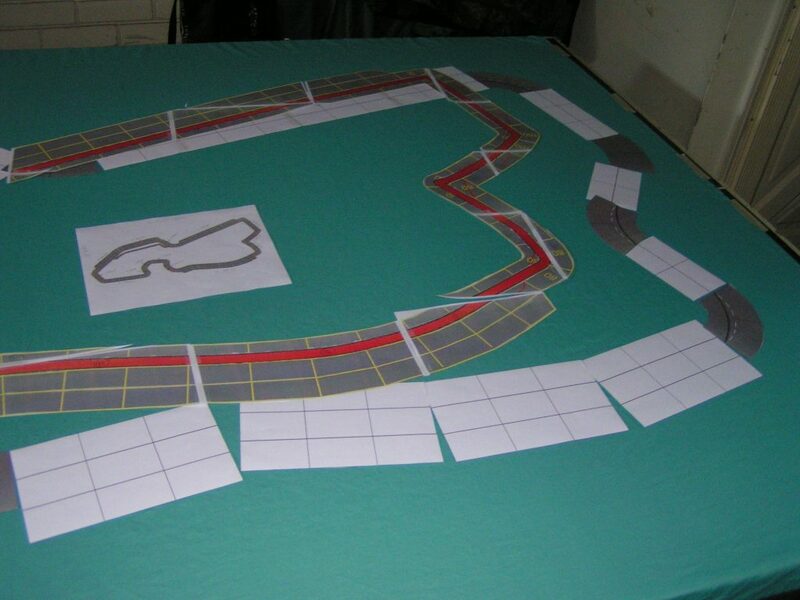 Next, retrieve the track templates you saved, and place them on the track where they belong (i.e., put the turn 1 template where turn 1 should go, etc). Track templates are back on the track. 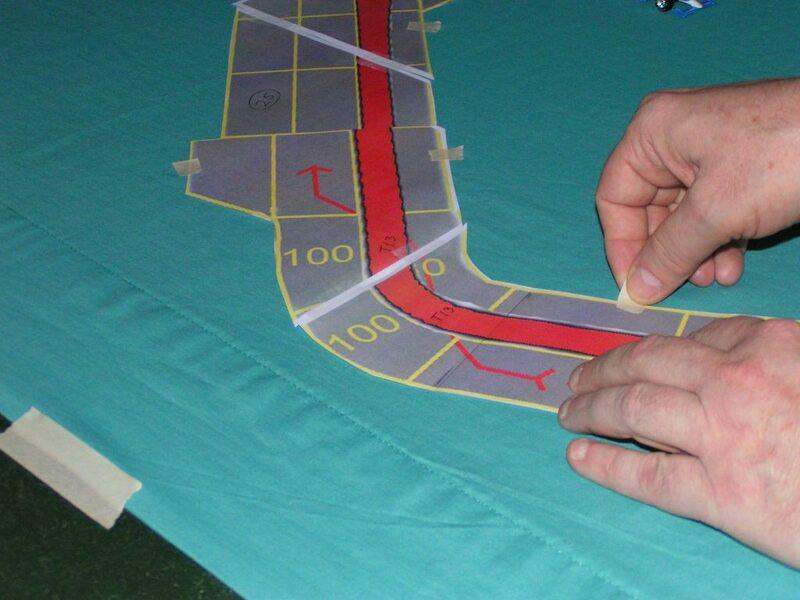 When you are satisfied with the track template placement, use your templates to mark where the horizontal lane lines will go to divide the track spaces. You should use a pencil to make “tick marks” on the sheet, just inside and outside the track. Then make tick marks with your yellow paint marker on the edges of the track. Note: You should only mark the spaces on straight sections at this time. Leave the corners and “curvy” straights for a little later. Tick marking the horizontal lines. 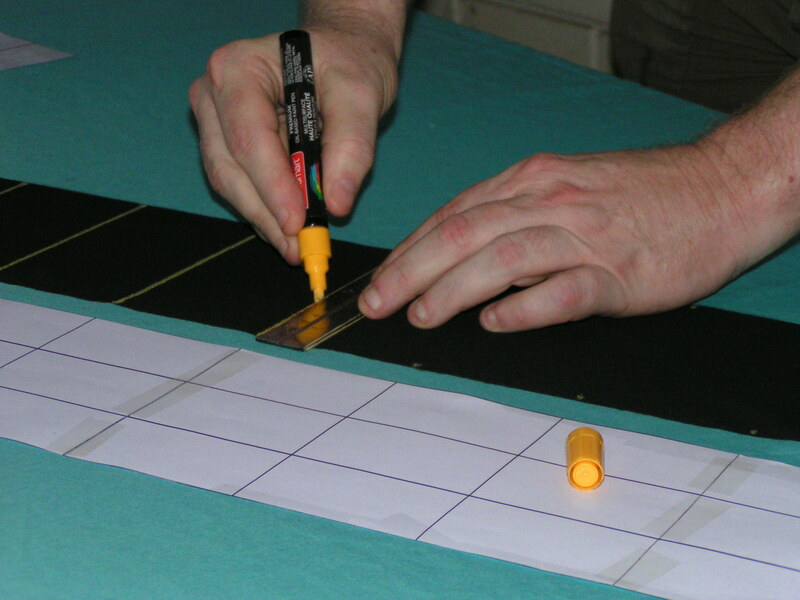 Then remove the template and use a ruler/straight-edge to make straight horizontal lines across the track with your yellow paint marker. The Belle Isle track layout from Wikipedia. 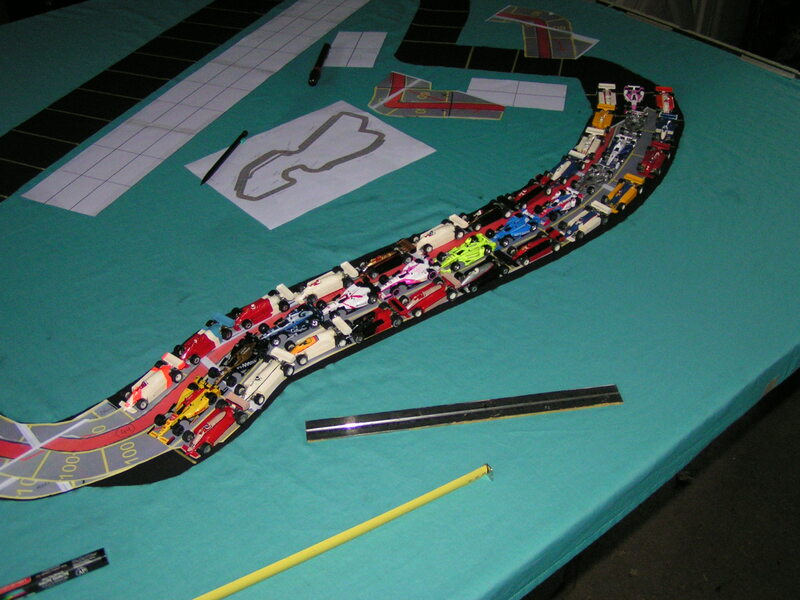 It was difficult to layout the horizontal spaces using a ruler or tape measure, so finally I just placed three rows of 1:64 scale cars on the track (with 12 cars in each row). 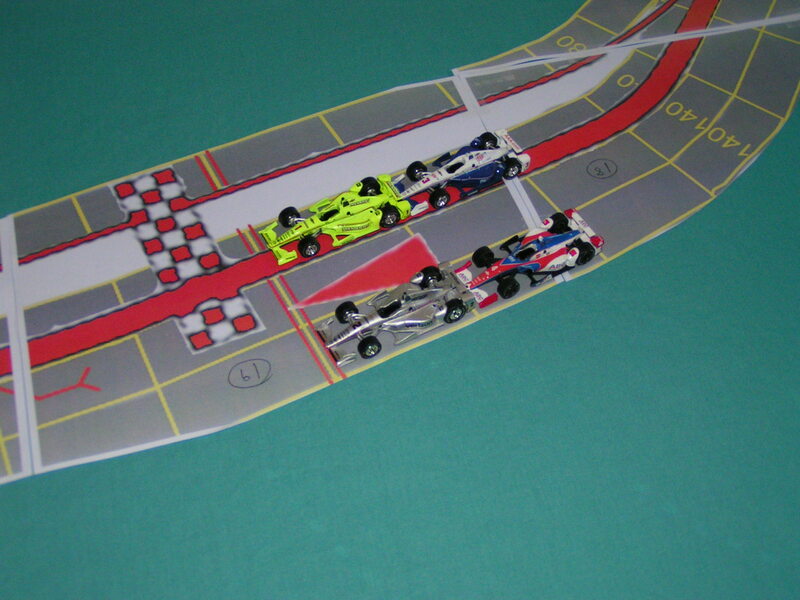 Using scale cars to determine track spaces on a curvy section of the track. There needed to be 12 spaces in this curvy section, so lining up the cars on the track template helped with initial alignment, but then I moved the cars a little until the spacing looked right. 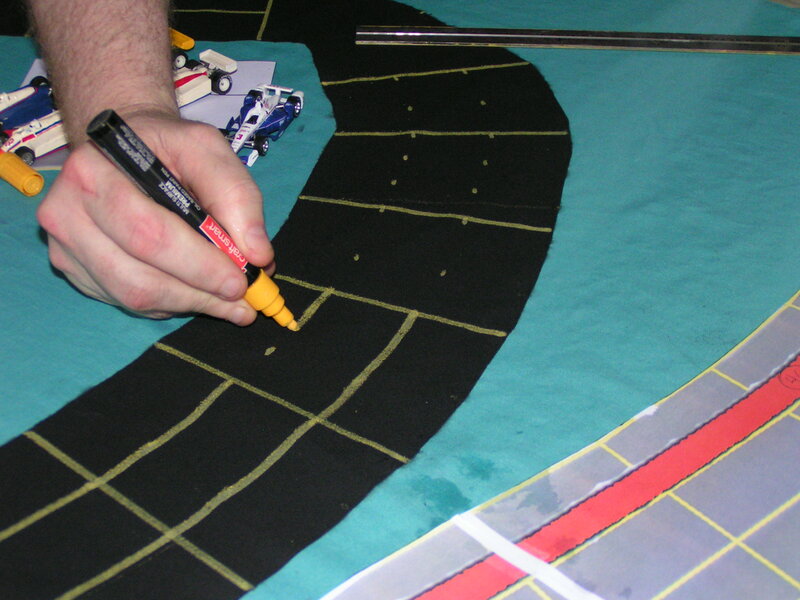 I then made tick marks with the yellow paint marker on both sides of the track, then removed the cars and the track template, then used a straight-edge to paint the horizontal lines in this section of the track. Horizontal lines are painted on the curvy section of the track. Note that a yellow line is missing in the left side of the above picture. I still wasn’t satisfied with where I had painted the yellow line, so then later I went over it with the black paint marker, effectively erasing that yellow line. Later, when the black paint dried, I re-painted the yellow line in a slightly different location. Horizontal lines are painted on the track. Give the just painted yellow horizontal lines a little time to dry (so you don’t smear them by rubbing your hand across them in the next step), perhaps 15 to 30 minutes, then paint the lane divider lines. For straight sections, I usually use the straight section templates, and make tick marks where the lanes should be. Placing tick marks where the lane lines will go. Lane lines have been added to a straight section. 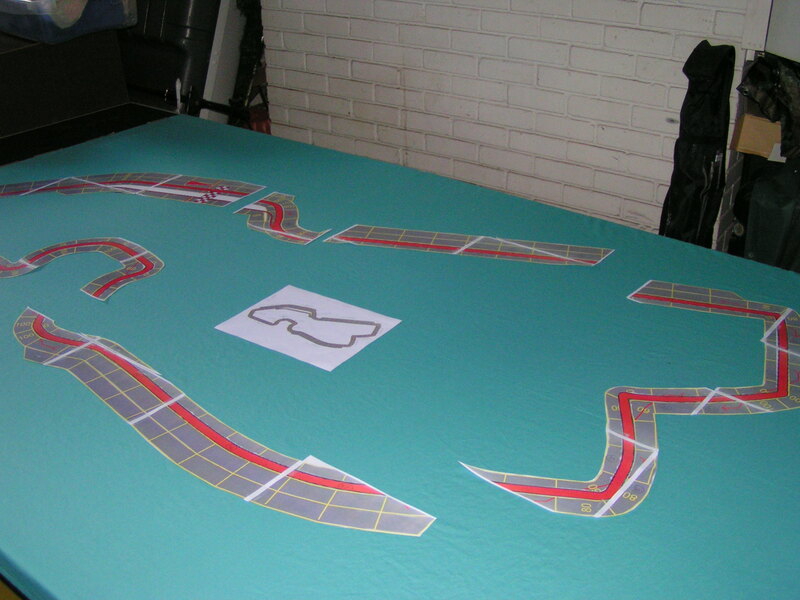 After marking the lane lines on all of the straight sections of the track, we have to add lane lines to corners and other curvy parts of the track. I use the ruler to make tick marks along the curves, then draw the actual lane lines “freehand.” It’s not that difficult to draw an arc. 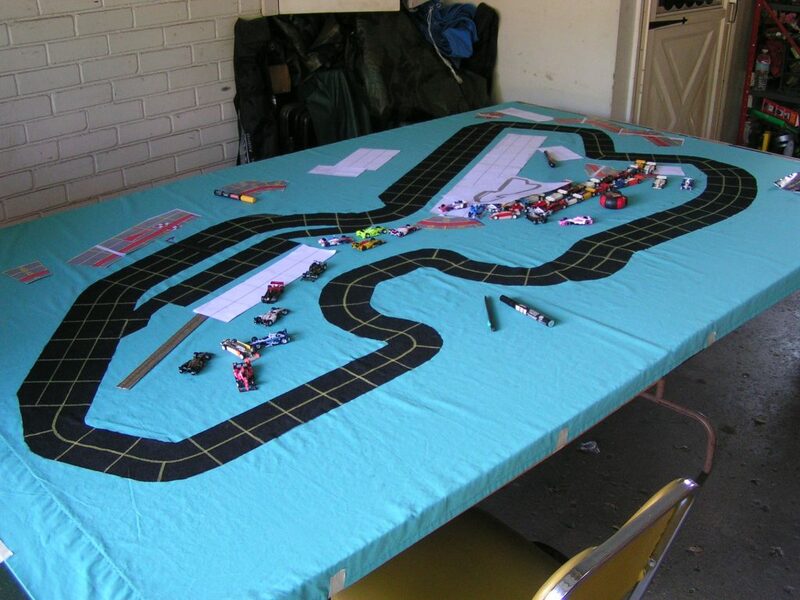 Just place the side of your hand on the table, and slowly “connect the dots.” To make the tick marks on this “3-wide” section of track, I marked ticks at 1.75″ and at 3.5″ from one side of the track. Drawing lane lines on curvy parts of the track. In the above picture you can see me drawing a slightly curved lane line. 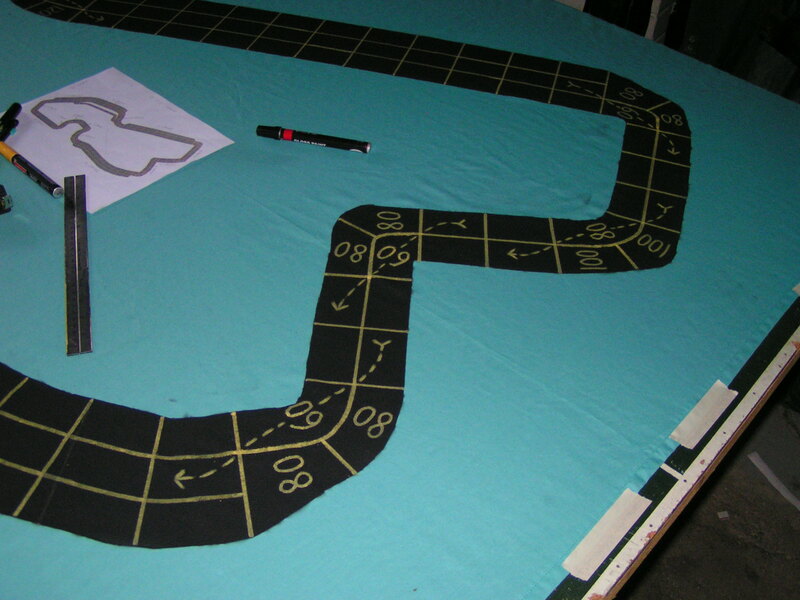 If you are not sure about this step, you could always practice on some scrap material before you draw on your track. But don’t worry about mistakes, because you can always use your black paint marker to “erase” mistakes you drew with the yellow marker! Now, some of the corners have one space in their inside lane, and two spaces in the outside lane. This means we need to draw a horizontal line to divide the spaces, but only in that outside lane. 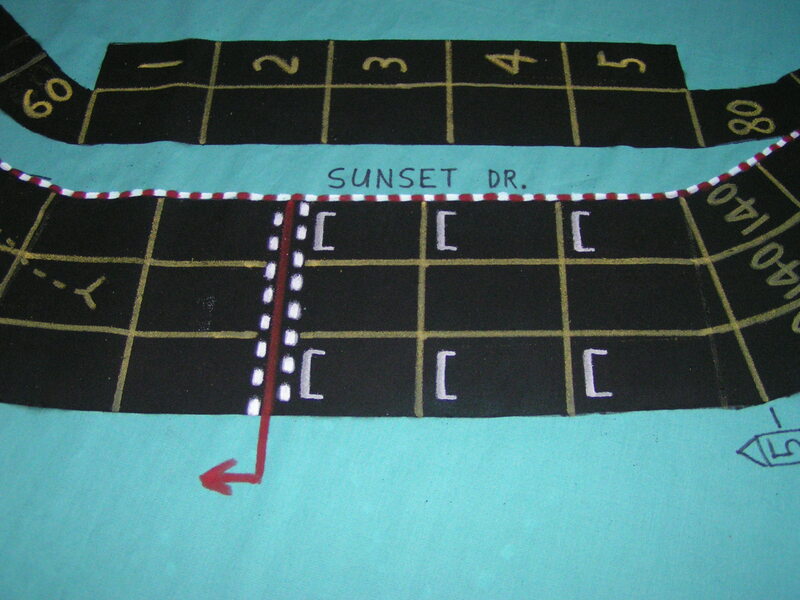 Which is why we had to mark all of the lane divider lines before we could divide the outside corner lanes into spaces. For this step, I once again like to use the actual cars I will use for races. Place the cars on the corner, and you can the best place to make that horizontal line. Make tick marks at either side of that outside lane, then remove the cars, and use a straight-edge to draw the line. All track spaces have been marked. Although I could have performed this next step earlier, I will now make a special start/finish line, to make it easily recognizable. 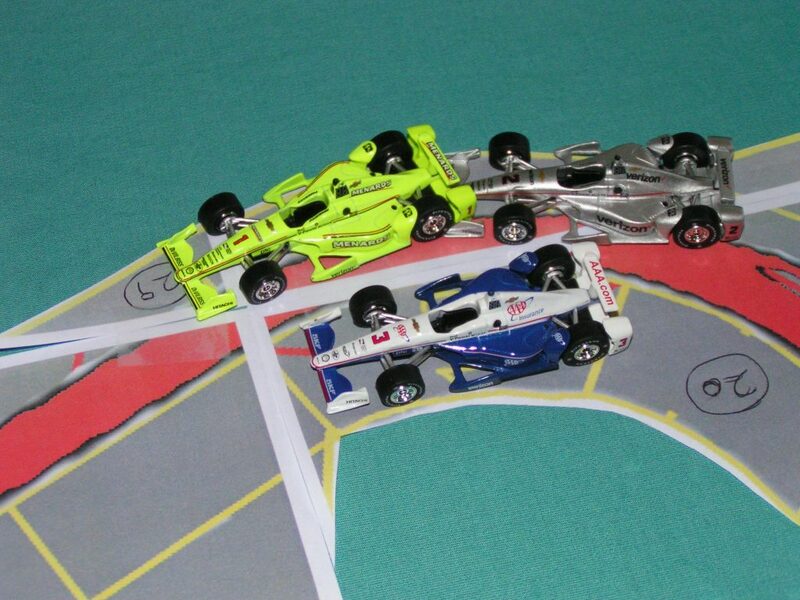 Most track spaces are marked with yellow lines, but to differentiate the start/finish line, I will use a white paint marker to create a sort of “checkered” line. 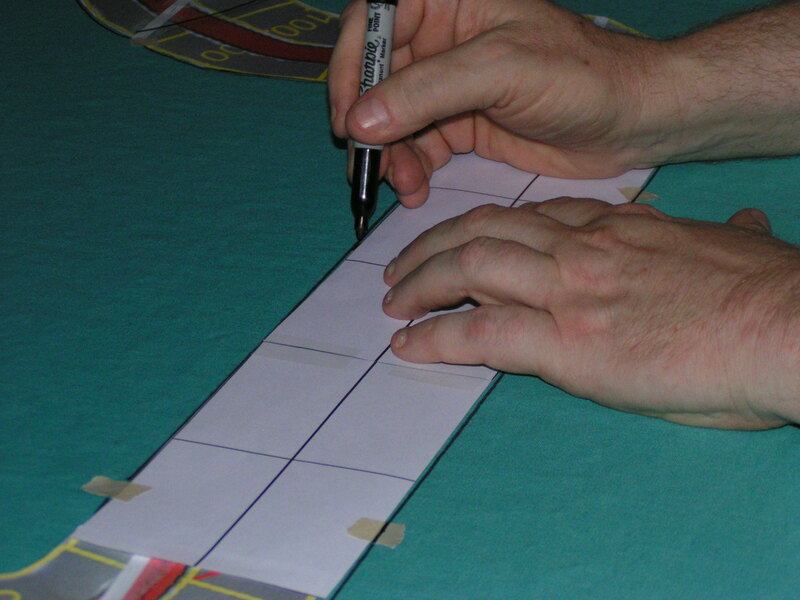 Use a straight-edge, and draw “dots” across the width of the track where the start/finish line will go. The start/finish line and starting spaces. I also painted an arrow off the extended start/finish line as an aid as to which way the direction of travel goes on that track. Of course, there are also the other cornering arrows, and I also draw the corner speeds so they are readable in the direction you approach them from. Note I also marked six “starting” spaces, like a real F1 race track would have (the real tracks will have more than 6 spaces marked as above, but three rows are sufficient for our game needs). Once all of the spaces have been marked with the yellow paint marker, use that same yellow marker to apply the speeds in the corner spaces. Make sure you refer to your track diagram to get the speeds and arrows in the proper spaces. Corner speeds and arrows have been added to the track. I will make two passes for this step. 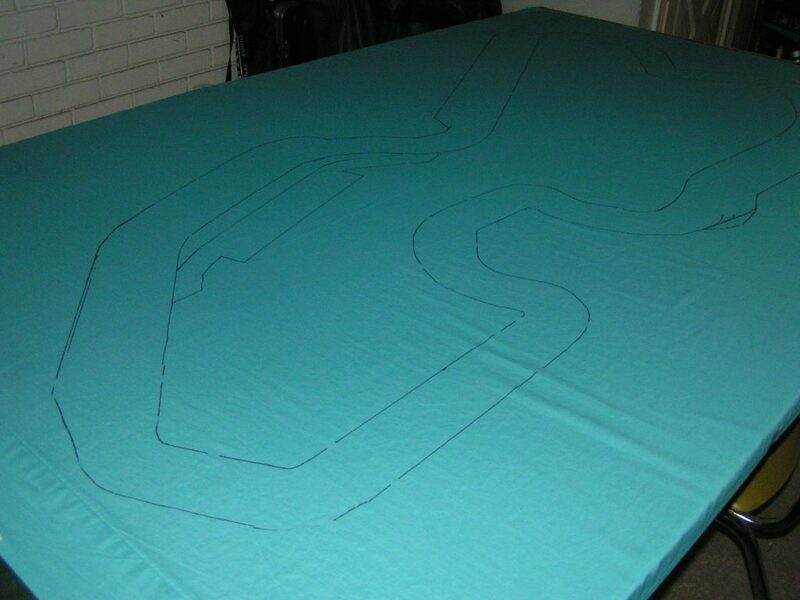 First, I will go around the track and mark all of the cornering speeds, then I will make a second pass and add the arrows. I will let the paint dry in between each step, so I don’t smear any previously applied paint will adding more speeds or arrows. I also go backwards around the track, so I don’t smear any speeds that I just marked in a corner when I add speeds to other spaces in that same corner. And after the corner speeds and arrows have thoroughly dried, you probably should go over them again, to make them brighter and easier to read from the other end of the track. When we originally made the tracks in the 1980s, we used red paint markers to mark off the track spaces, etc, but we found that the red lines are too hard to see from some angles. We now use either yellow or white for all of the lines and speeds and arrows. The higher contrast between the black track and the yellow or white lines makes it much easier to see the spaces, no matter where one sits around the track. Red and white stripes have been added to the sides of the track. Either use a black permanent marker or a black paint marker to add the name of the track, its location, miles per lap, and years it was raced on. Add this somewhere in the infield of the track, if you can, although it could be anywhere. Name of the track has been added. 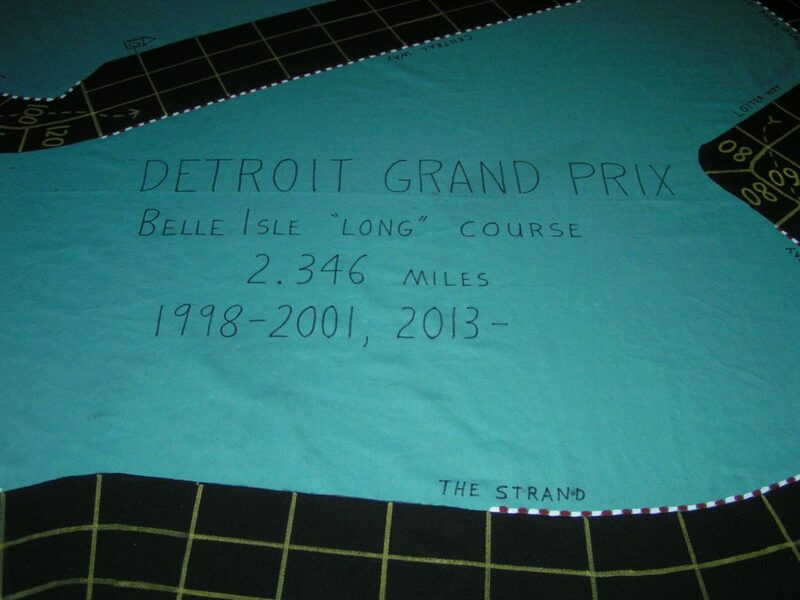 Notice that I also added the actual name of the road, “The Strand” that the track is on at that part of the Belle Isle track. In other pictures you can also see a “5” or a “10” in a box outside the track. Those numbers are a play-aid so drivers can more easily count the number of straight spaces remaining until the next corner space. Here’s a little trick to line up the letters nice and even. Mark some pencil lines along where the top and bottom of the letters will go. Pencil lines were used to line up the lettering. Although the pencil lines may be hard to see in this picture, they are there. 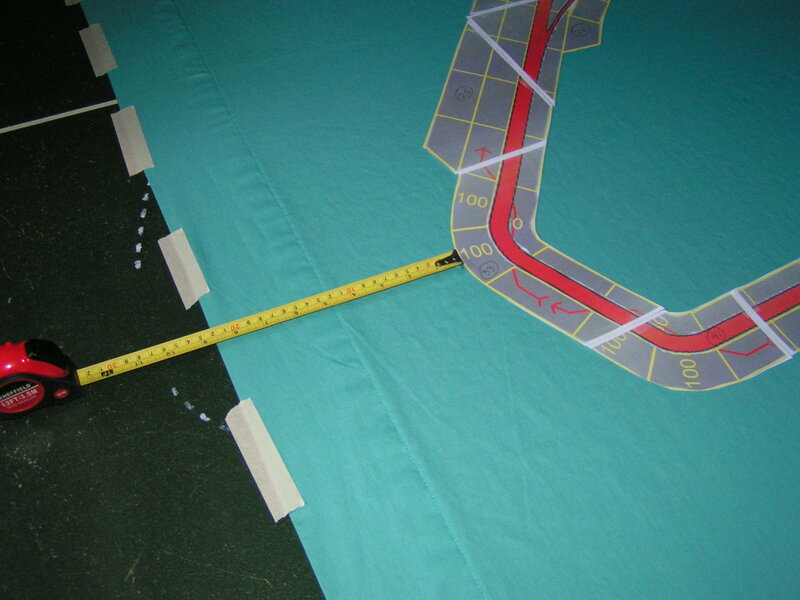 I used my tape measure to make tick marks at several places, measuring from one side of the table’s edge. 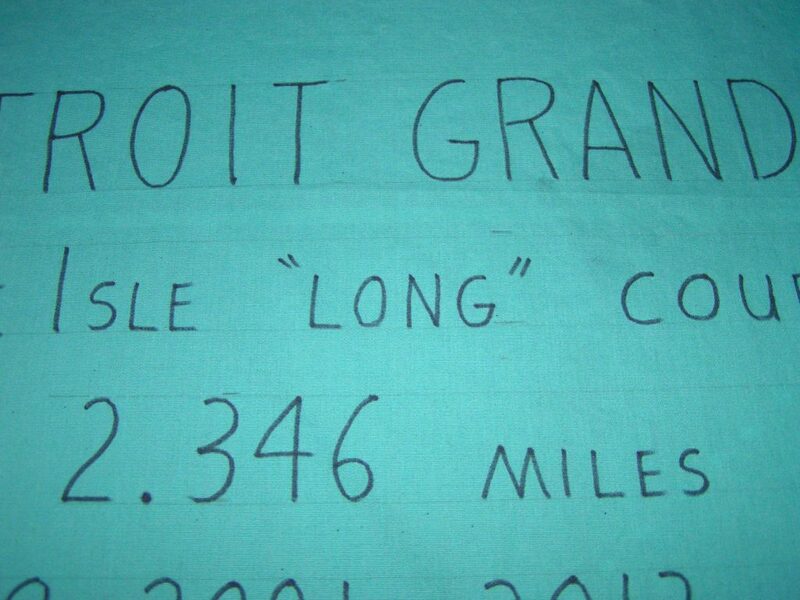 I made the tick marks for the top row (the “Detroit Grand Prix” row) 2″ apart, then the other rows are each 1.5″ high. There is a 1″ space between each row. You can use whatever spacing looks good to you. If you haven’t done this kind of lettering before, mark all of the letters in pencil before using a permanent marker. If you absolutely can’t print neatly, and don’t have time to take drafting classes so you can print neatly, you could always use some lettering stencils or get a friend who can print well to mark the name on your track. I also add the track name to a corner of the sheet, to make it easier to tell which track it is when it is all folded up for storage. Recently, I’ve also been adding its years of use if you might have different versions of a track. Track name on the corner of the sheet. I wrote the track name on both sides of one corner of the track, so it doesn’t matter which side is folded to the inside when the track is folded. 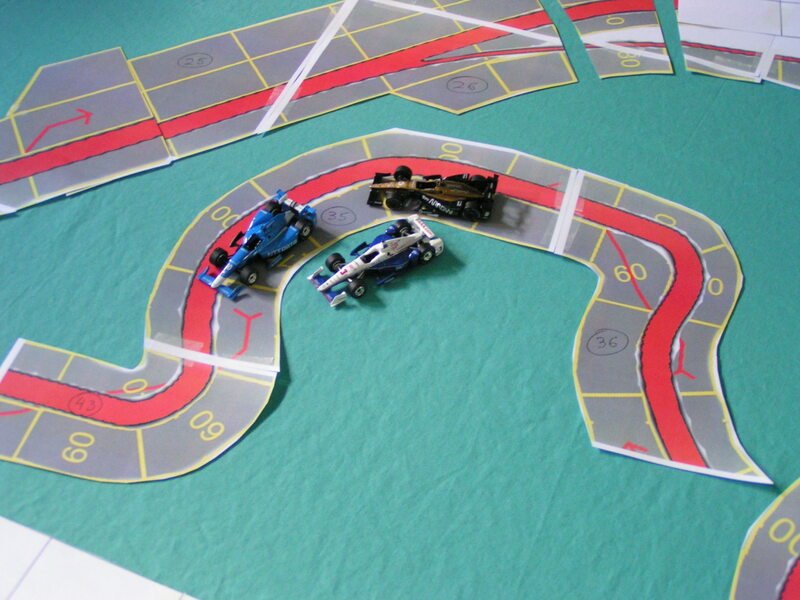 It is probably better to fold the track with the painted side to the inside, just to better protect it. We used to just apply a piece of masking tape to the folded track with the track’s name, but tape will fall off after a number of years, so using a permanent marker is a much better way to go. 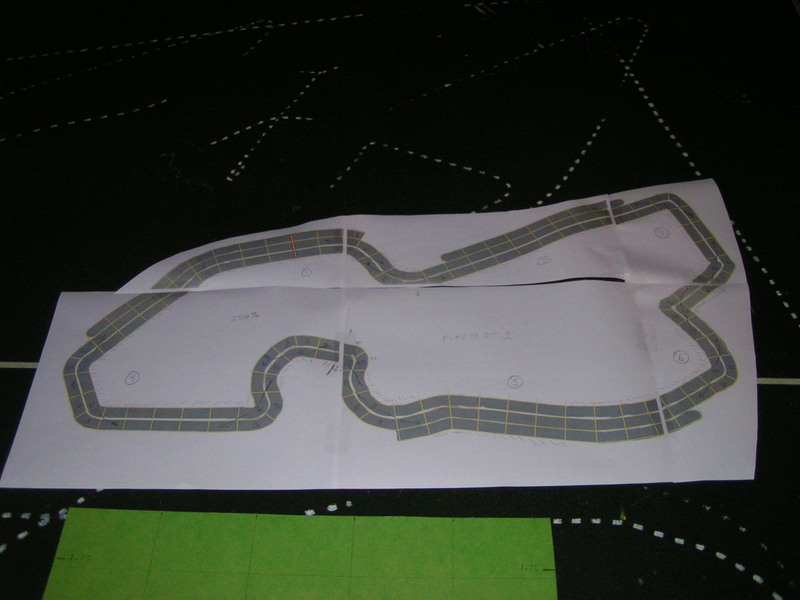 And since some tracks have had revisions over the years, (see the many changes of the real life Silverstone, England, track as an example), the years for a particular track configuration have been added. 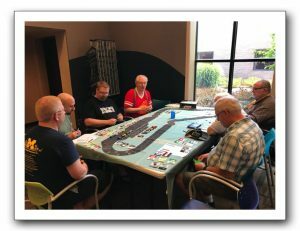 I’ve also been adding what minimum table size is needed to use that track, so you’ll know what size or how many tables you’ll need to set it up. 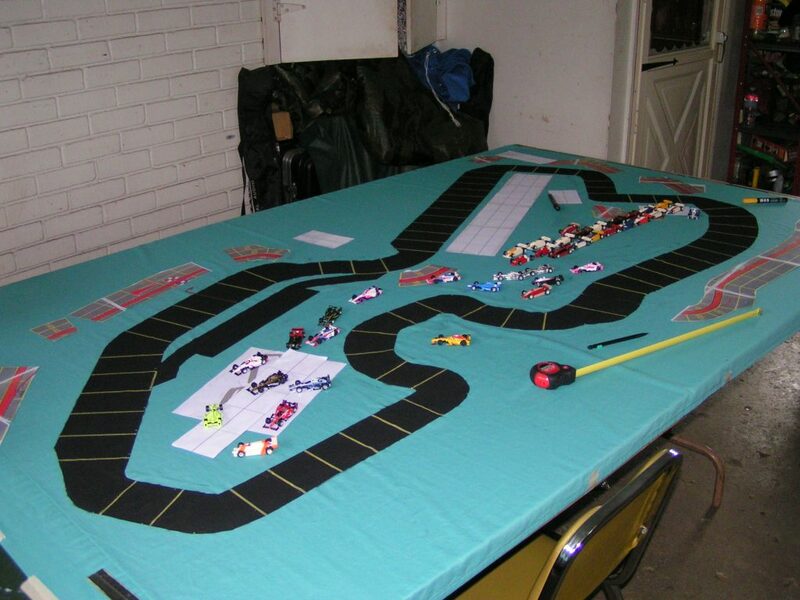 In the case of this Belle Isle track, the minimum table size is 3’9″ wide by 7’1″ long. In practical purposes, this will probably be used on a 4′ x 8′ table top. At last, the track is finished. It’s time to race! 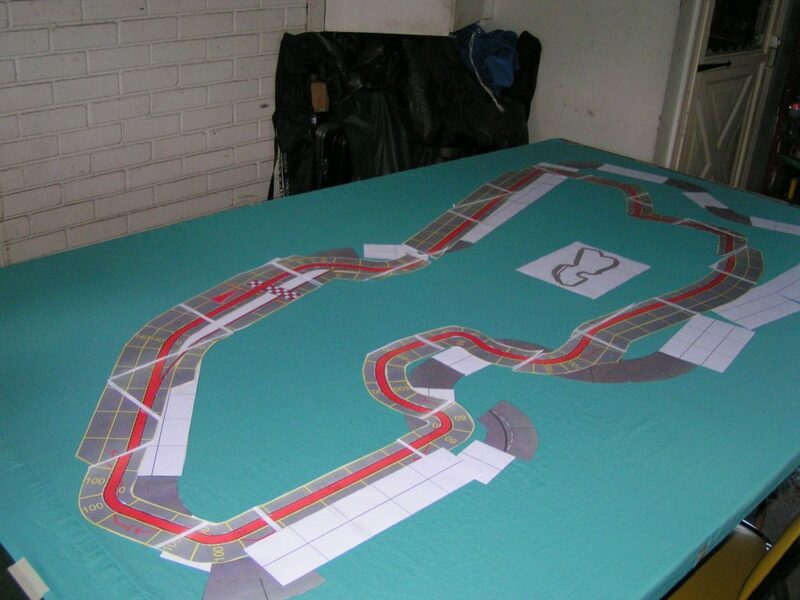 I have posted recently about playing Speed Circuit (past) and Championship Formula Racing (present) on large-scale tracks that were painted on bed sheets. 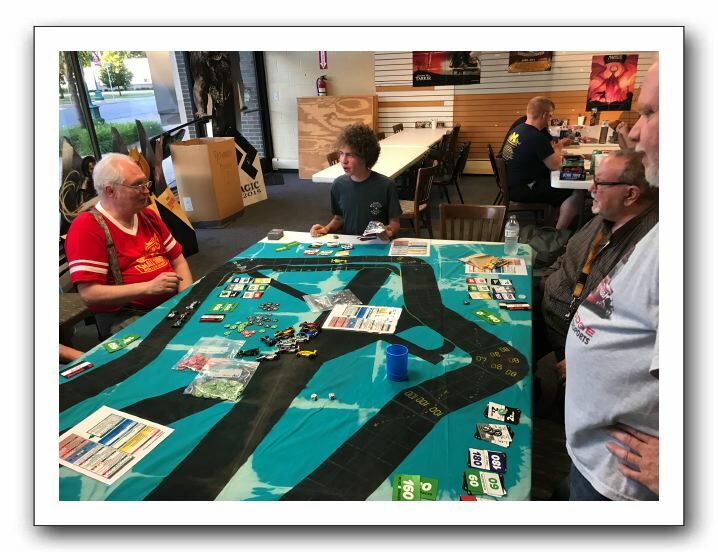 Some folks on the CFR forums at BoardGameGeek (BGG) have asked me to show the process, so here goes. Disclaimer: Since I am in the United States of America, I use inches, feet, etc, and also relate car speeds as miles per hour. If you are in a metric system country, you will of course want to adjust the measurements for your system. 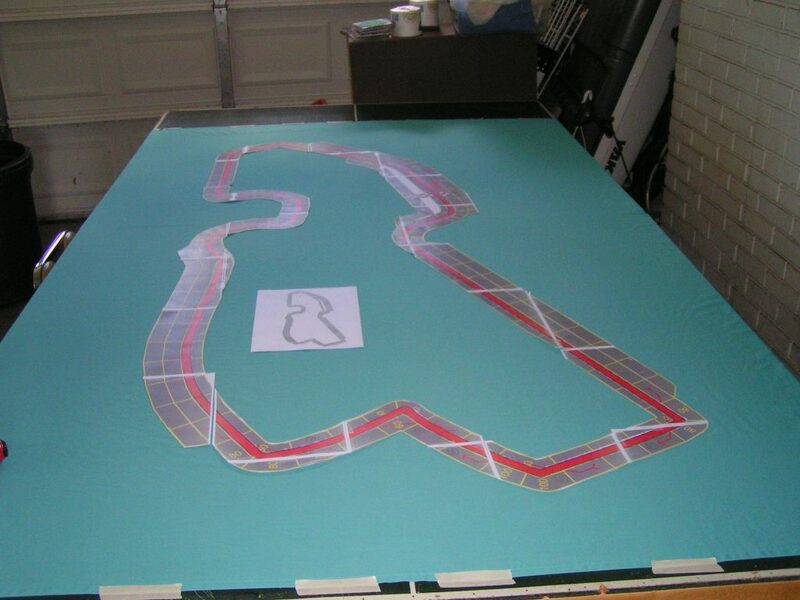 First, you will need a diagram of the track you want to make. 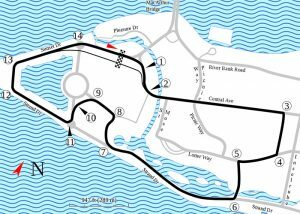 I recently designed the Belle Isle (Detroit) track that is used by IndyCars. 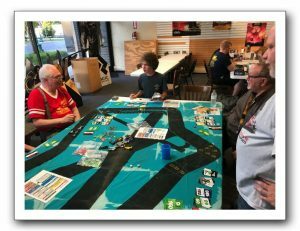 I did find that track had already been designed by someone else (I downloaded it from the Files section at BGG), but I didn’t like the design. Some of the straightaway sections were too long in that other design, so cars could use a high top speed in the game to go 200 mph or so. Watching the video of actual IndyCars racing on the Belle Isle track, I never saw any car get much above 160 mph at any time. 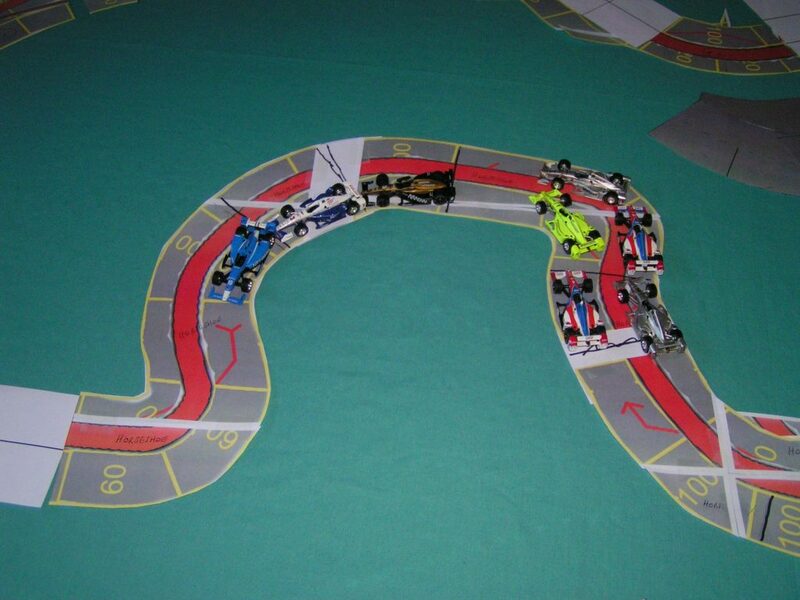 That other track design also ignored some of the corners in the corners 7 through 11 sequence, and also treated corner 14 as just another straightaway space. 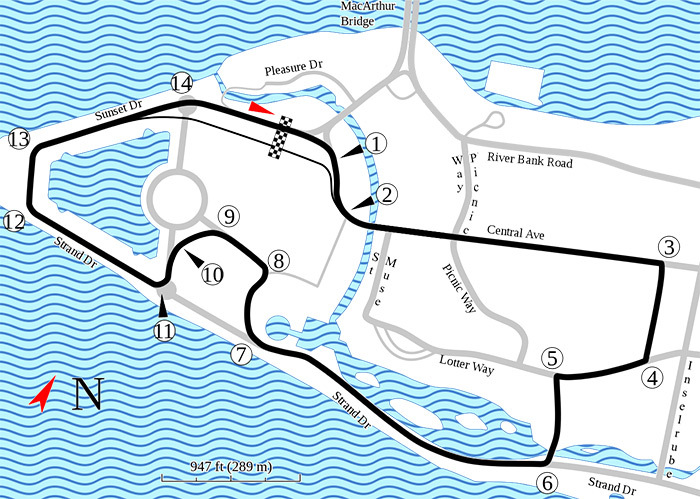 I first obtained the real Belle Isle track outline diagram from online. I used Wikipedia as a source, but there are alternate sources for tracks that you could use if you were designing your own track. 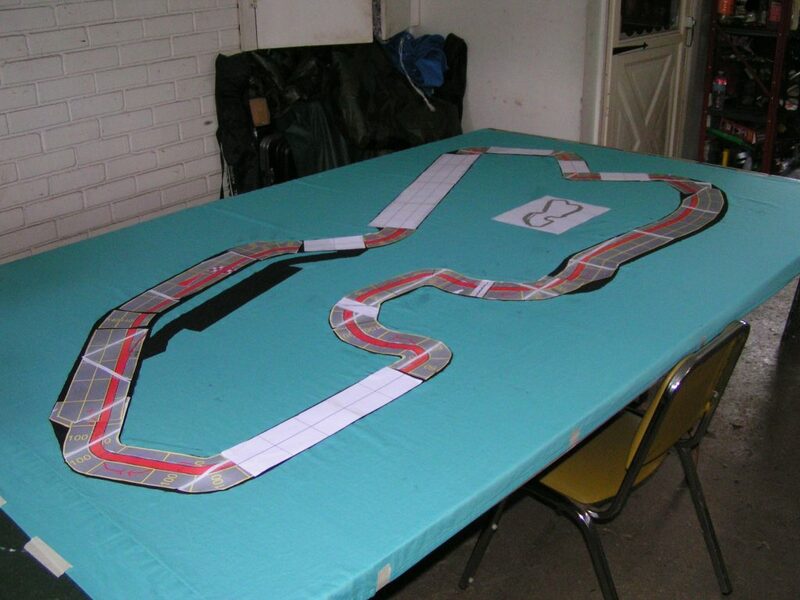 Belle Isle original track in red, with gray spaces for the board game track. Acorn is a layer-based program like Photoshop, so you can make layers visible or invisible, change which layer is on top, etc, so that made the above process relatively easy. 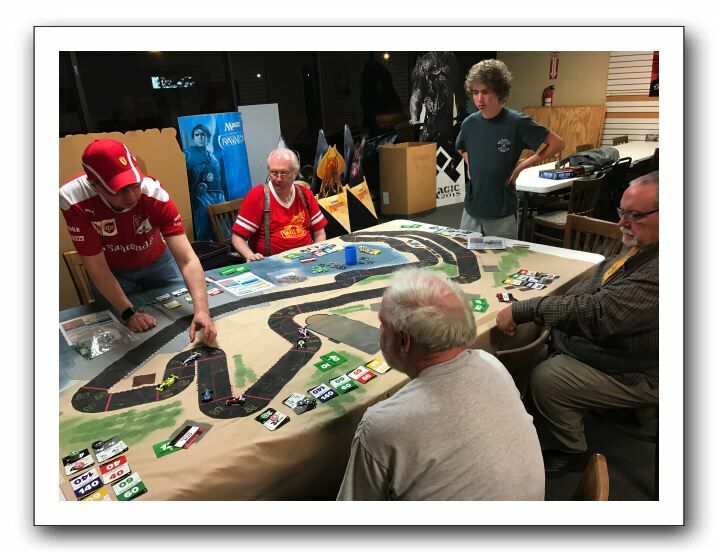 Next was to print the track the size of a poster board, and then I ran some solo races on it using the CFR rules and cars of different configuration. I did make a few changes to the initial playtest track, so the “playtest 2” track above is how I finalized the spaces and corners. Except, I’m not sure about the speed of the final slight right-hand bend at the upper left of the track, just after the entrance to the pits. 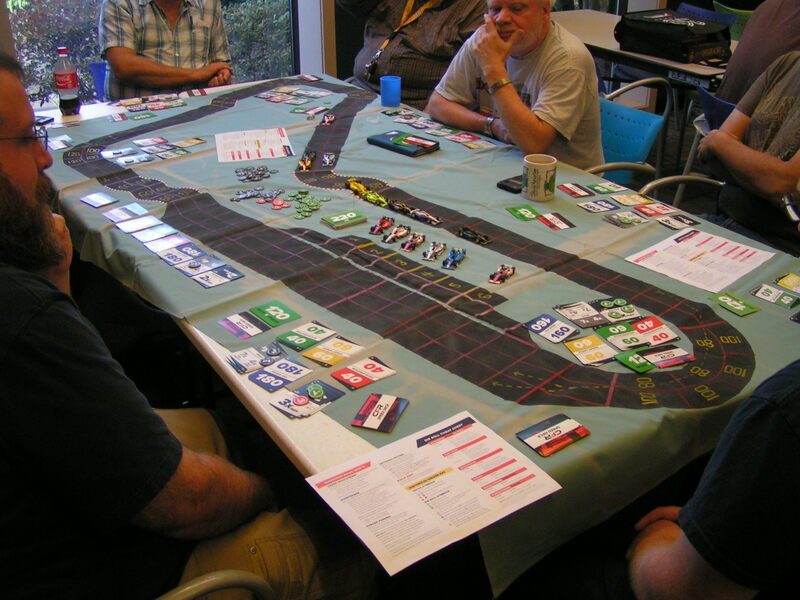 I have 140 mph marked on it for now, but may change it to 160 mph after I get some other folks to playtest it. 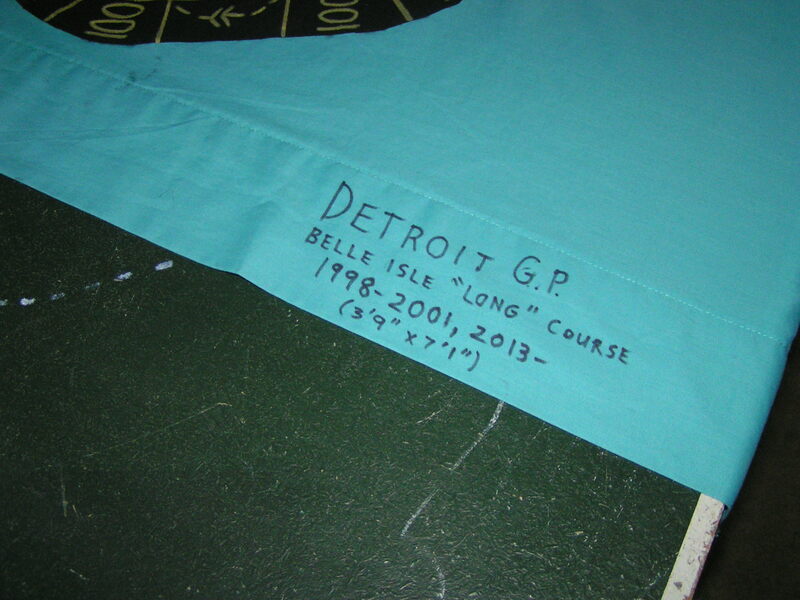 Poster board size Belle Isle track. Gather items you will need to build a large track. 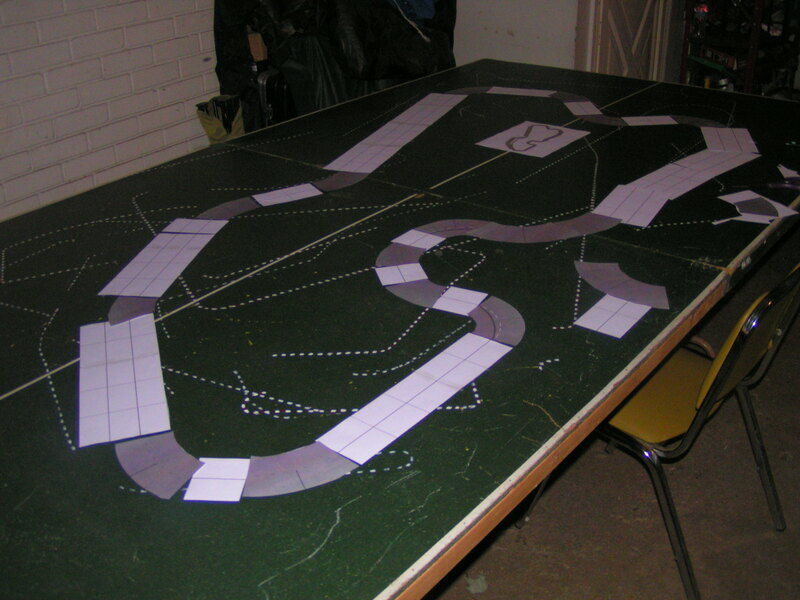 Track building items laid out on the table. 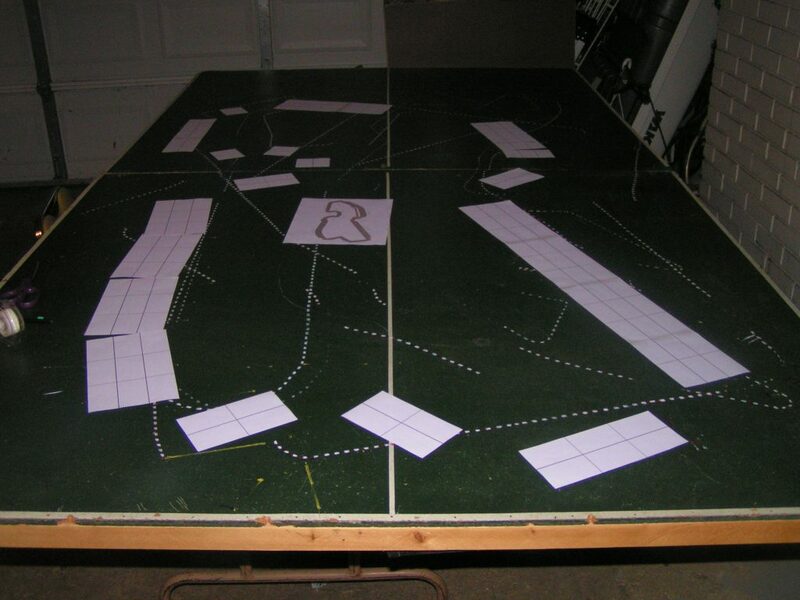 A large table ( I use a ping-pong table that is 5′ x 9′ in size — you will probably need something larger than a 4′ x 8′ piece of plywood, as some tracks are larger than 4′ x 8′). You could also use a large area of the floor, if you are younger than me, and have good knees! Track template pieces. I used to use poster board to create various sizes of straightaways (either two-lane or three-lane wide), but now I find it’s easier and cheaper to just print paper on my laser printer. I create spaces for straights that are 3″ long by 1.75″ wide, as that size space fits my 1:64 scale race cars well. If you make the spaces much smaller than that, cars will be too tightly spaced together if they are crowded into the same area of the track. 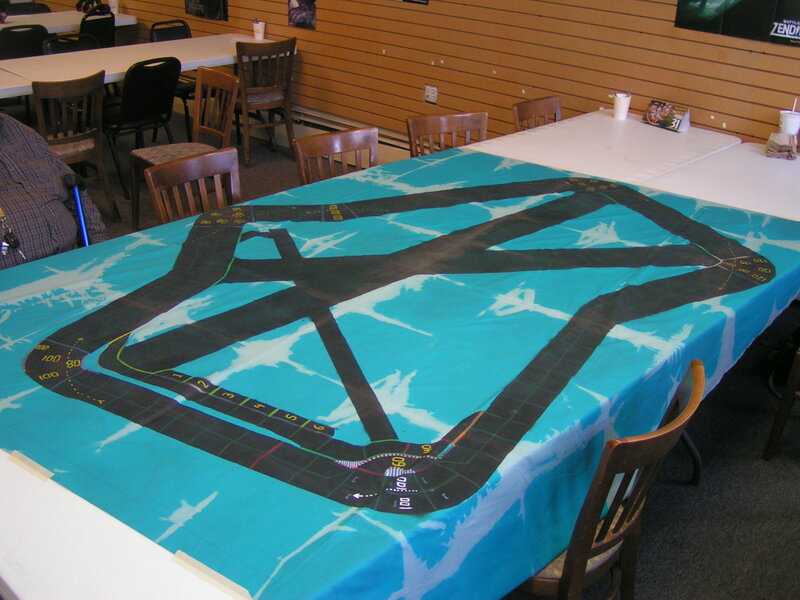 If the spaces are too large, you might not be able to fit the finished track onto a reasonable table size. I also used to just “fudge” in the corners after laying out the straight pieces, but now I also print out some generic corner pieces. I found some generic track sections online, and printed them at different scales until I got the right size. 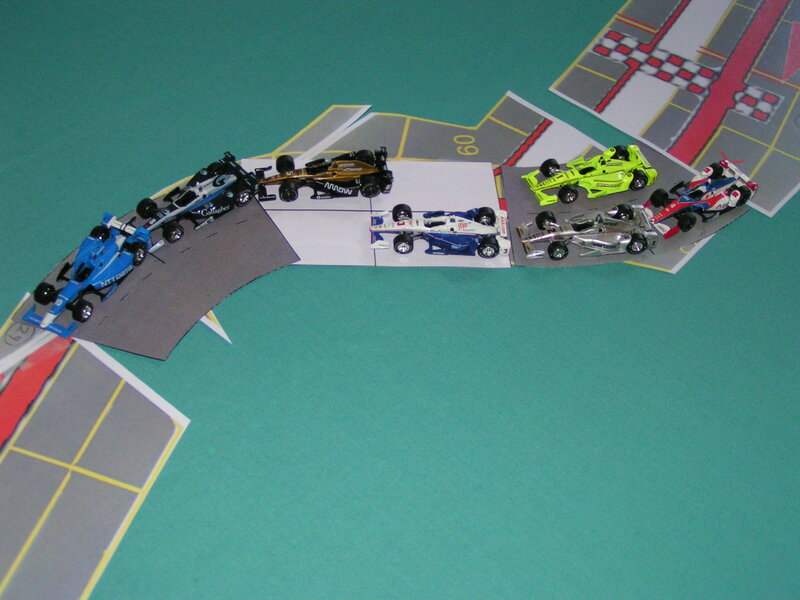 I also tested the printed corner pieces to ensure my 1:64 scale cars would fit in the spaces on those corner pieces. 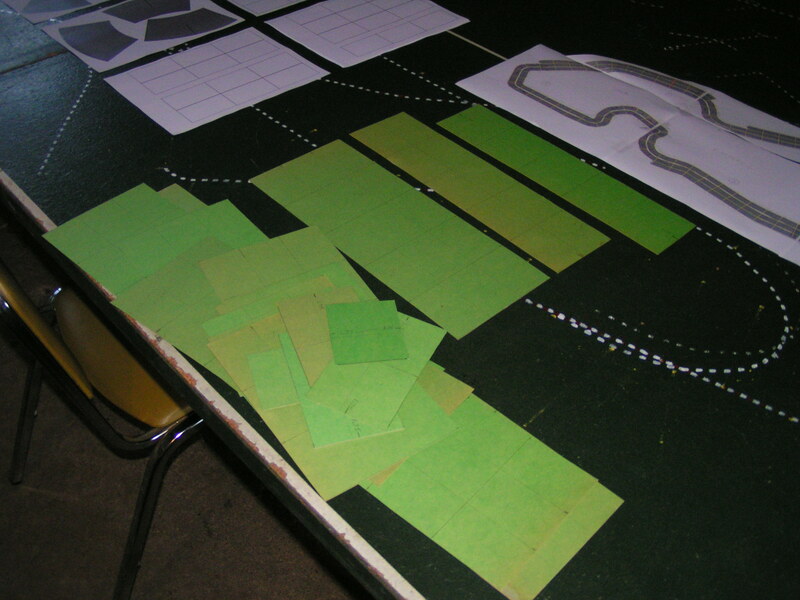 Older green poster-board track template pieces in the foreground. A pair of scissors for cutting the track templates. A straight edge of some sort to help with marking straight lines. I use an old steel ruler from an old combination square. 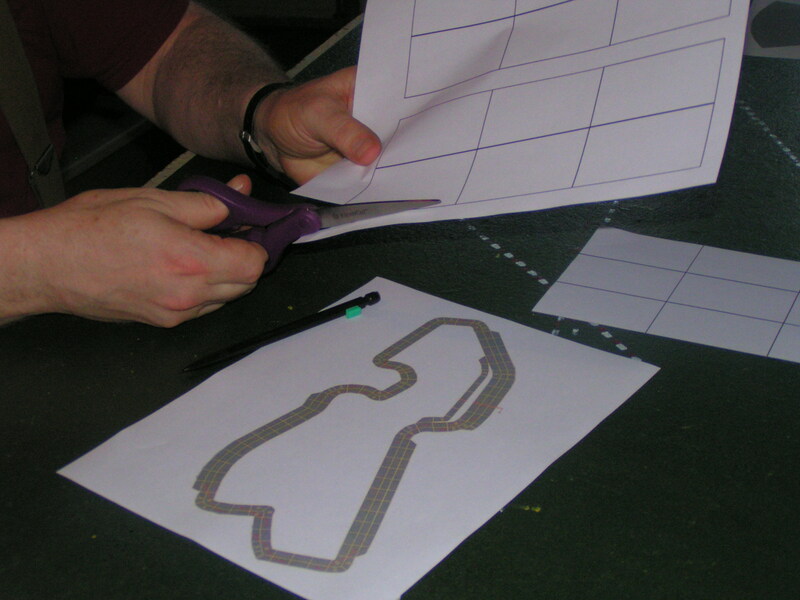 A pencil to mark the basic outline of the track once you have completed the layout. 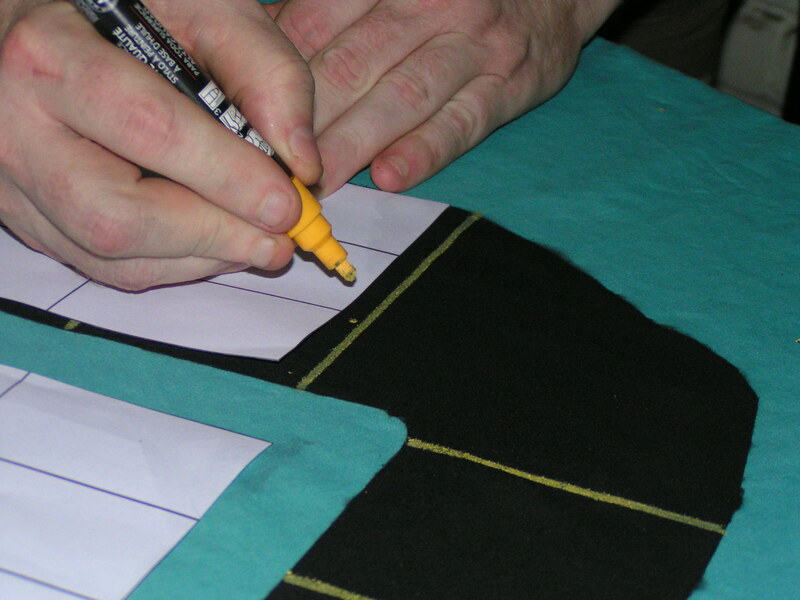 A black marker (like a Sharpie), used to go over the penciled outline of the track. Clear cellophane tape. 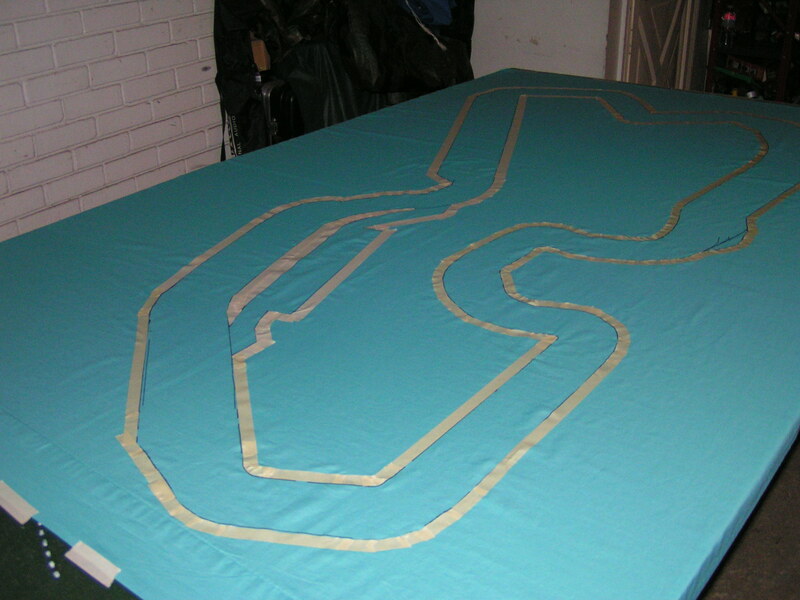 Use the tape to tack small track sections together to build assemblies, so there are not as many loose pieces to move around when you make track adjustments. Masking tape. 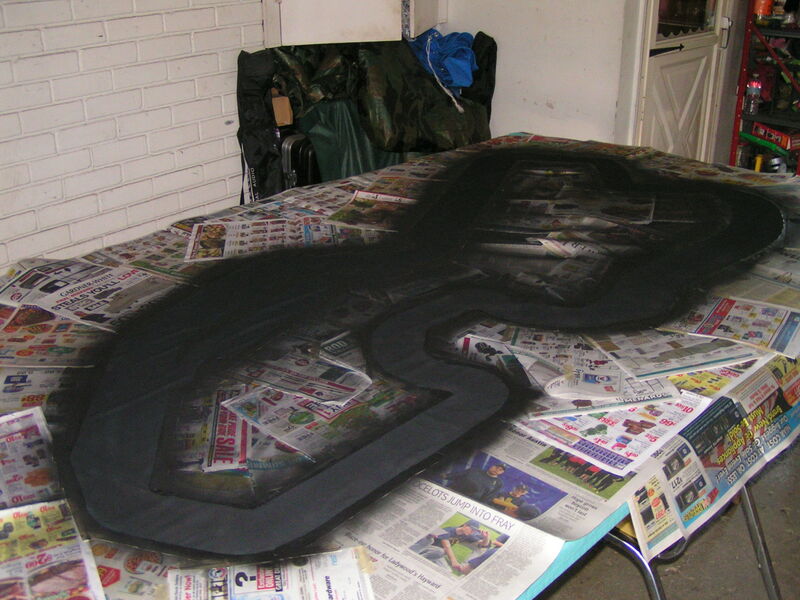 Used to mask the track so you only paint the track. Miscellaneous newspapers, pieces of cardboard, etc. Use these to actually mask areas of the sheet that you don’t want to paint. A can of flat black spray paint. You could also brush flat black paint onto the sheet, but I find spraying is easier, and doesn’t bleed-through the sheet as much as brush painting. Different colored paint markers. I use black (preferably flat black), red, white, and yellow paint markers. Get oil based paint markers, as they won’t wash out if you ever have to wash your track. These markers are used to paint the lines for the spaces on the track, cornering speeds & arrows, and the red-and-white lines along the edge of the track to denote which side of the track is the inside to the next corner. A flat bed sheet. 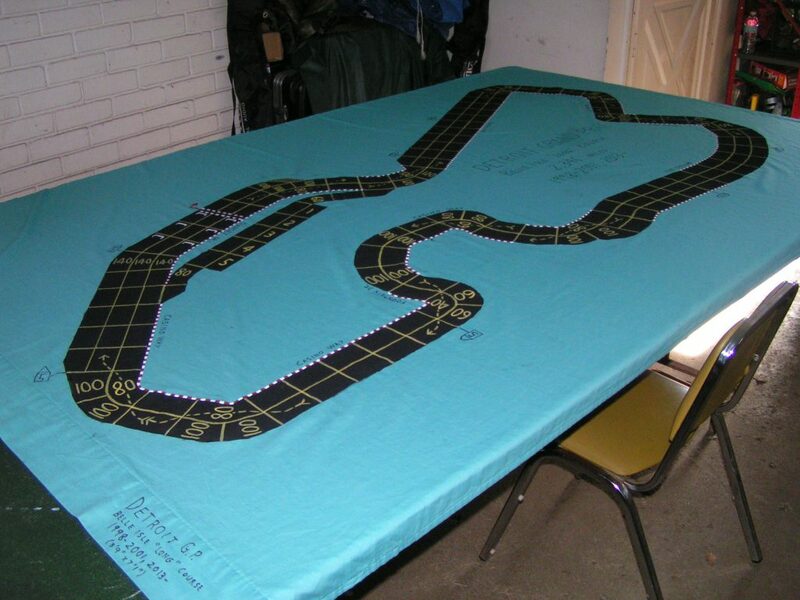 Wait to buy the sheet until after you determine how big the track will be. 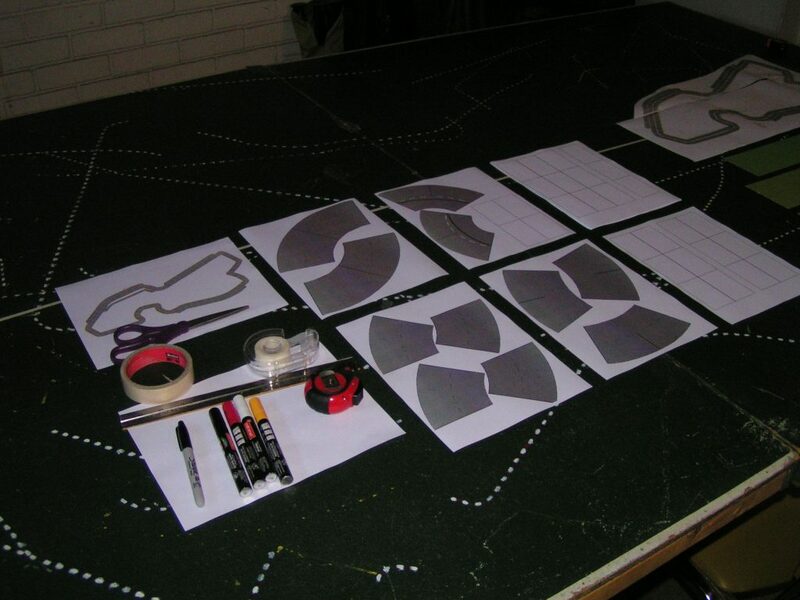 Cut out the various straight and curved template pieces. 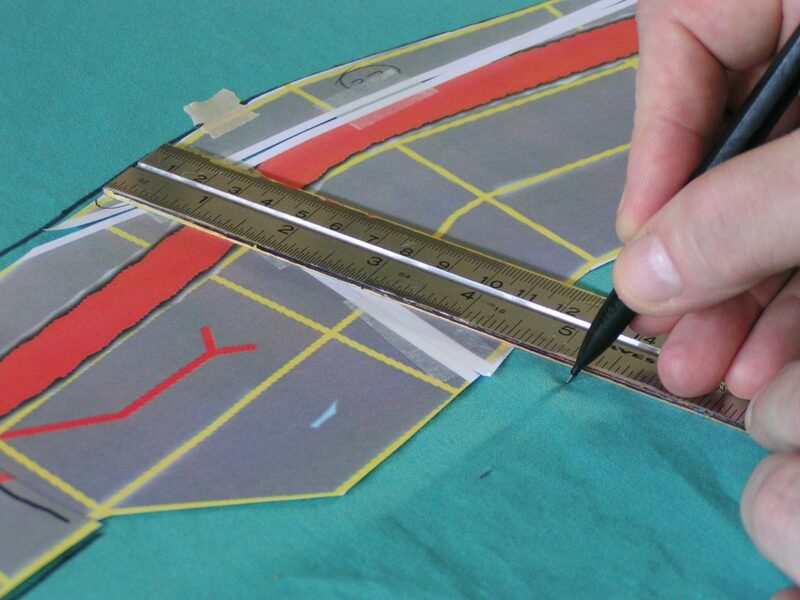 Cutting out paper straight-section templates. Then, tape together straight sections to make longer pieces. Do this so you won’t have as many pieces of paper to move around. 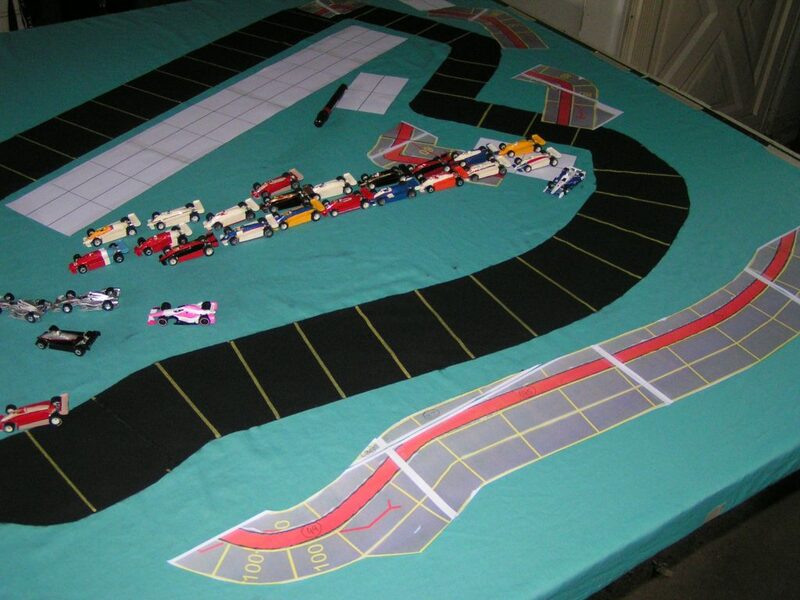 For the Belle Isle track, I needed straight sections of various spaces long, such as 12 spaces long, 5 spaces long, etc. 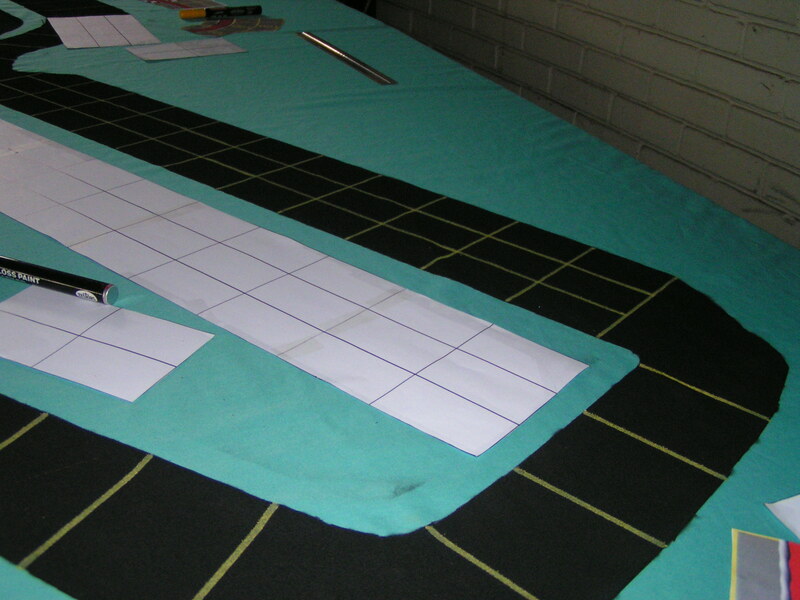 Taping straight templates to make longer straightaways. After you have cut out and taped your various templates, place the various lengths of straight sections about where they should go. Use the track diagram as a guide. I also wrote the number of straight spaces in each area directly on that track diagram, so I wasn’t always re-counting the straightaways. The straight sections of track have been placed in their approximate positions. 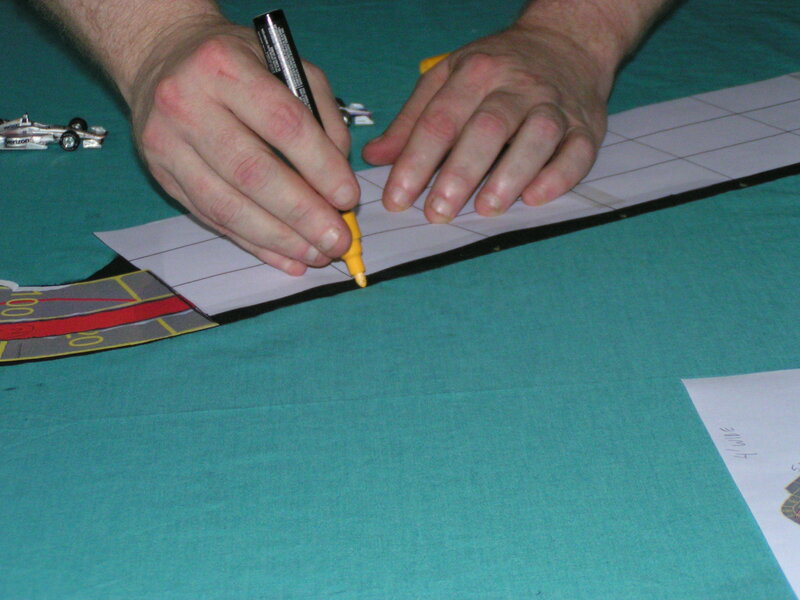 In the above picture, the straight pieces are roughly where they should go. Don’t worry about exactness, as you will have to make adjustments. 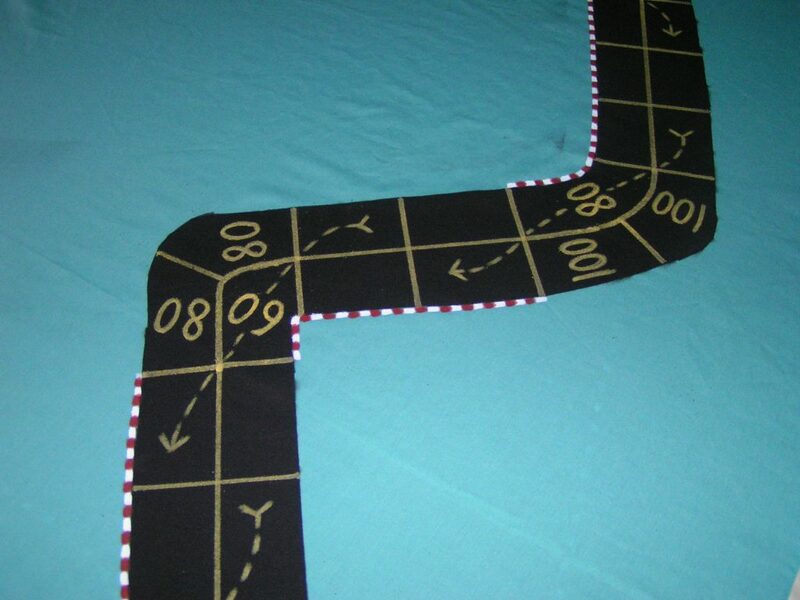 Then add the corner pieces, and try to “close the loop” of the track by making adjustments as needed. Curves have been added to the track. 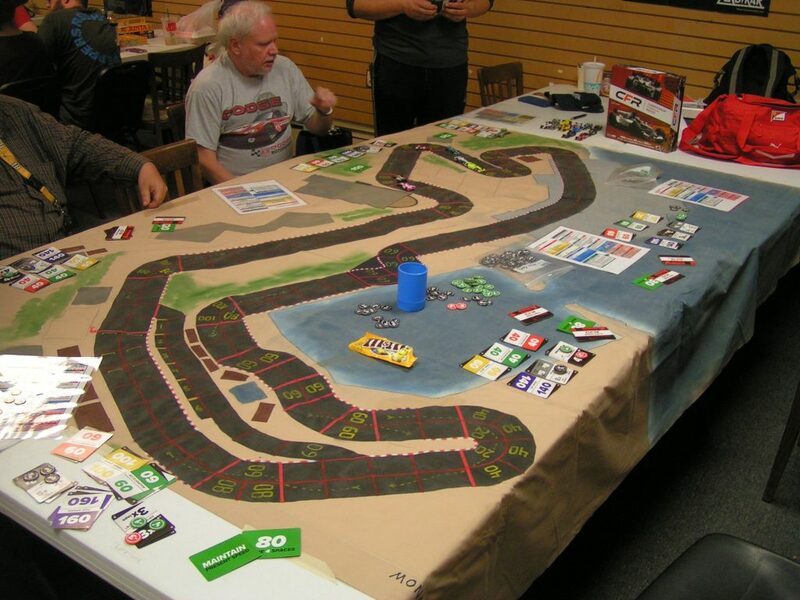 In my example above, you can see that the track will actually fit on the table. Yay! A view of the other side of the track. 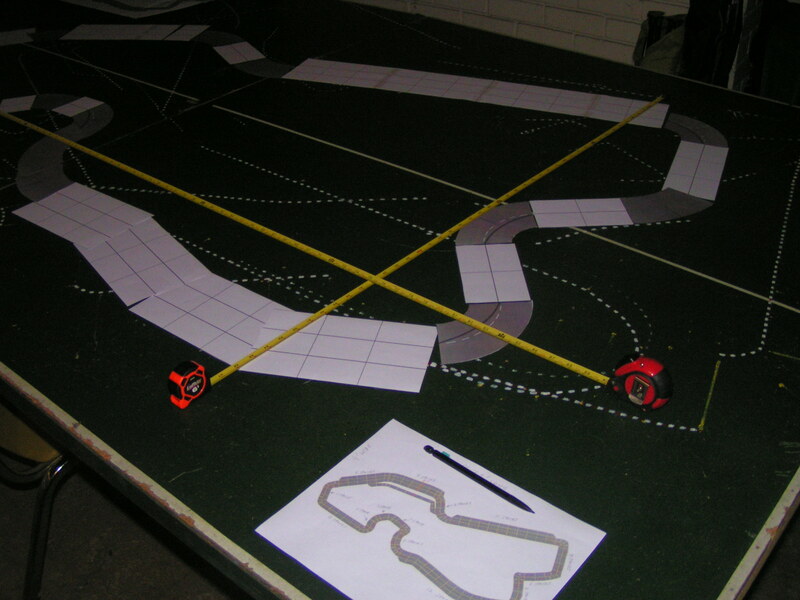 The next step is to measure the longest distance of the track’s length and width, and write down the numbers. 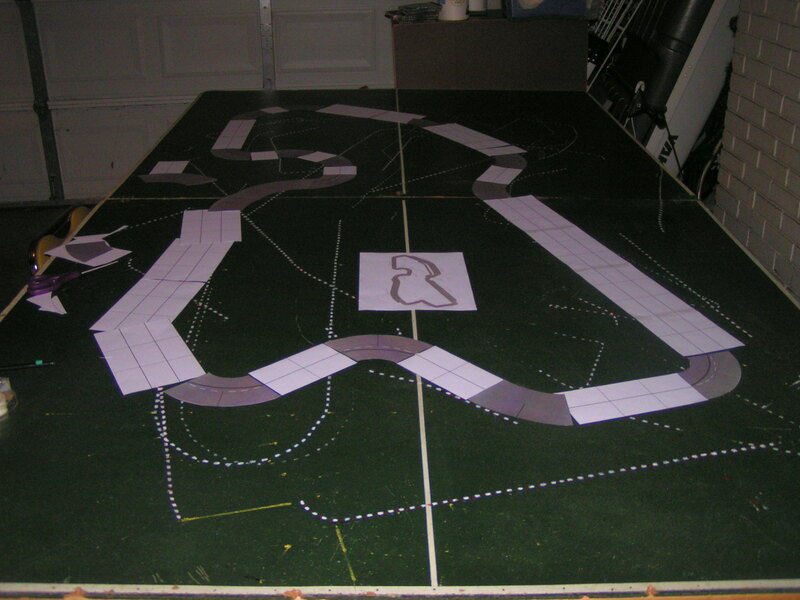 For my Belle Isle track, I found the rough layout was about 4′ wide and 7’6″ long, so the finished track should be able to be played on a 4′ x 8′ table size. This is now the time to purchase the flat bed sheet. I was able to purchase a flat sheet that is 66″ x 96″, or 5’6″ x 8’0″, for about $5 (US). For you metric folk, that sheet is 168cm x 244cm. 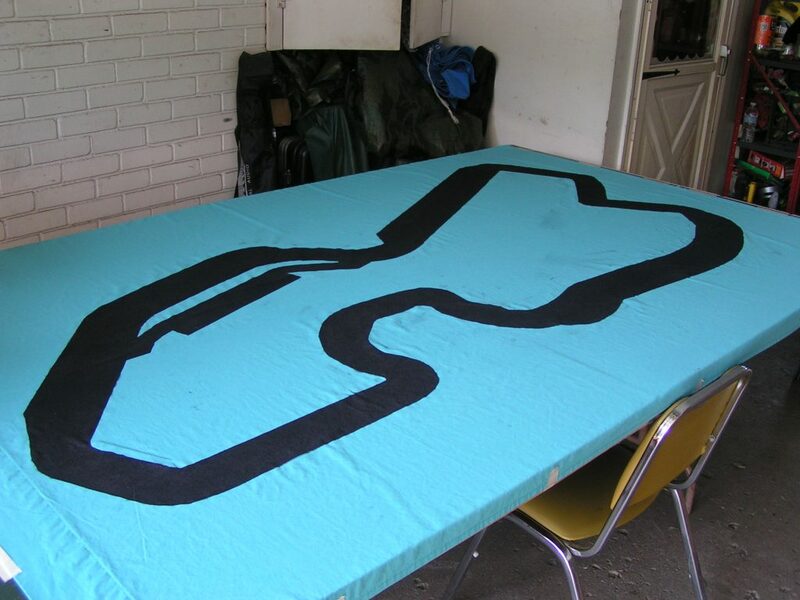 Of course, before you can use the sheet, you will need to wash it, as the sheets are usually packed very densely, and the wrinkles will make it difficult to paint the track later. Also throw the sheet in the dryer (if you have one) after washing to “pre-shrink” it. 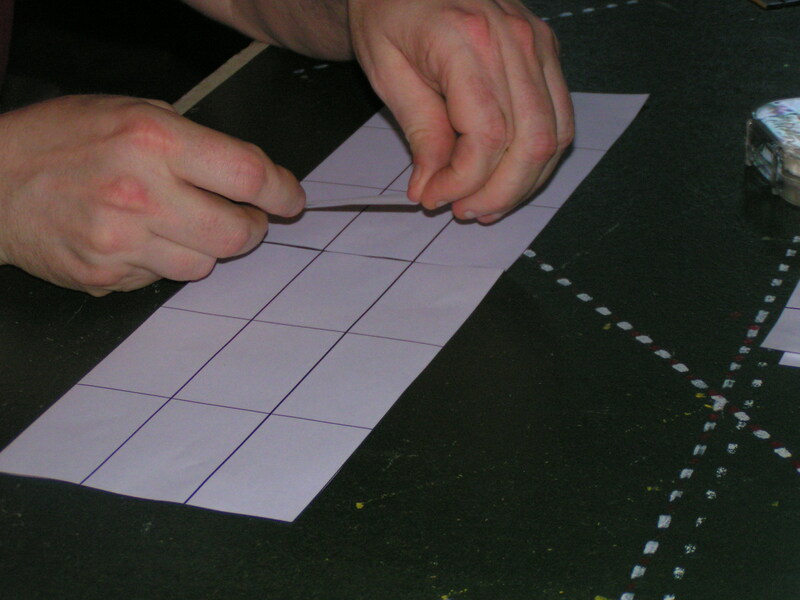 Continued in Part 2 – Marking the track on the sheet. Also see Part 3 – Painting the track.